We supply and install reconditioned stairlifts and reconditioned platform lifts to homes and businesses all over Ireland. You can save a lot of money when opting for a reconditioned accessibility lift. The average saving you will see from one of our reconditioned platform lifts is 50% of the cost of a brand new platform lift, and the average saving you will see on one of our reconditioned stairlifts is 30% of the cost of a brand new stairlift. All of our reconditioned lifts are fully refurbished and fitted with brand new rails. They also come with all the latest technology and safety features that you would find on a brand new lift. We have a rigorous testing procedure that we carry out before installing any reconditioned lift. We clean down every part and swap out batteries and PCB boards where necessary. All of our reconditioned platform lifts and reconditioned stairlifts come with a 2 year warranty. Rest assured that we are ready to fix any problems that you might find in our lifts. 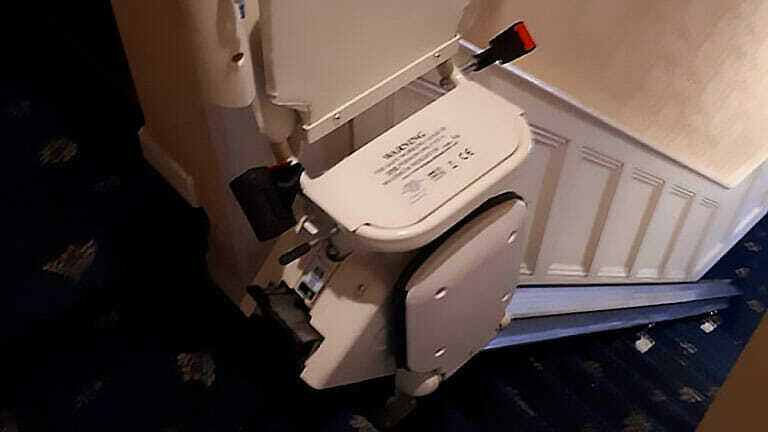 Like a brand-new stairlift, they come with all the latest technology and safety features. All of our reconditioned stairlifts are fitted with new rails, which are customised to your home. A vertical platform lift – also known as a wheelchair platform lift or porch lift – was specifically designed as a means to facilitate wheelchair users from getting from one level to another. Click here if you like to talk to one of our experts.